Present some examples of ceramic slab vessels and sculptures. See a similar lesson at Arts and Activities by Christine Kernan, Tomahawk Elementary School, WI. Let students choose leaves (I provided several different types), discuss textures and shape of leaves, determine if symmetry is present. Distribute slab of clay to each student, they roll out the slab to the size needed (use guide sticks to insure even thickness) and press their leaf firmly into the clay. Cut around the leaf with a craft stick (or clay needle if available) and gently smooth cut edges with water/slip. Carefully lift the leaf and clay into a bowl, gently pressing it into the shape of the bowl. Remember to keep the leaf on the clay so that while you are pressing the leaf into the bowl you are also pressing the texture into the leaf. When the clay is secure in the Styrofoam bowl the real leaf should be peeled off and discarded (leave may be left on the clay as it will burn off in the Kiln ). I had the students write their names on the bottom of the Styrofoam bowl before we started the project and then I inscribed their names on the bottom of the clay when I was able to lift it from the bowl on the following day. When I lifted the clay from the bowls the shape of the clay leaf remained in a bowl shape. Larger bowls could be made by pressing (and gently rolling in) various leaves -- then cutting out a circular or irregular shape. Carefully smooth cut edge. Drape the clay over a bowl or plaster hump (leaving the leaves in the clay). Scribe name on bottom of bowls. Allow to dry to leather hard stage and remove from hump. Bisque fire when bone dry. Stain leaf textures with under glazes then coat with Clear Glaze . Denise Pannell found this lesson idea on United Art Education site. Leaves Plaque made with air dry clay (Clay Leaf Collage). Denise had trouble trying to use firing clay but found the new Crayola air dry clay worked great. 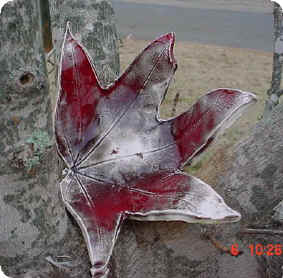 If you want to use firing clay with leaf molds, you can spray just a bit a Pam on the mold and the clay will release. You can use real leaves quite nicely for this type of project (you don't even have to lift the leaf off the clay - it will burn off in the kiln). If using real leaves and you want more relief, you can remove leaves and carve with wire loop tools.